Using some of the most powerful nuclear magnetic resonance equipment available, researchers at the University of California, Davis, are making discoveries about the shape and structure of biological molecules -- potentially leading to new ways to treat or prevent diseases such as breast cancer and Alzheimer's disease. "These are exquisite three-dimensional objects, and the structures really give insight into how they function in the cell," chemistry professor James Ames said. In a paper published online Jan. 29 by the journal Nature, Ames and colleagues at the University of Toronto and the University of Cambridge, England, offer insight into the hot topic of calcium channels, linked to Parkinson's and Alzheimer's disease, among other things. 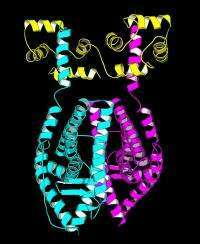 The researchers described the workings of two protein channels that are similar in structure and function. Inositol triphosphate is the "key" that unlocks the inositol triphosphate receptor, opening a gateway that releases calcium inside the cell. The ryanodine receptor does the same thing when it binds another molecule, ryanodine. The new three-dimensional view shows that although the sequences of these proteins are different, their structures at the "receptor end" are very similar. "They are basically superimposable," Ames said. They are also interchangeable  if the "receptor end" of one is grafted to the "calcium channel end" of the other, the receptor still functions. When activated with the right amount of calcium, one calmodulin protein attaches to two estrogen receptors and draws them into a bear hug. That structure, or dimer, is then sensitive to the estrogen's attaching to another part of the molecule. In the right amounts, the combination of estrogen, calmodulin and calcium allows the estrogen receptor to attach to DNA and turn particular genes on or off. The structure also reveals how calmodulin stops the estrogen receptor from being broken down and removed. Another protein, ubiquitin, is responsible for attaching to proteins inside cells and flagging them for disposal. Calmodulin blocks those parts of the estrogen receptor where ubiquitin can attach. That could result in a buildup of estrogen receptors  which is associated with tumor formation, Ames said. X-ray crystallography at the University of Toronto figured in the inositol triphosphate receptor work, while Ames' team used the 800-megahertz nuclear MRI to work on the inositol triphosphate receptor and the calmodulin/estrogen receptor. Similar to the MRI machines used in hospitals, nuclear magnetic resonance spectroscopy provides information about both the structure of molecules and how atoms are moving within them. More information: Coauthors on the Nature paper: Congmin Li, Davis; Min-Duk Seo, Noboru Ishiyama, Peter Stathopulos and Mitsuhiko Ikura, University of Toronto; Saroj Velamakanni, Ana Rossi, Samir Khan, Philippa Dale and Colin Taylor, at Cambridge University. Additional authors on the Journal of Biological Chemistry paper: Yonghong Zhang, UC Davis, and Zhigang Li, National Institutes of Health.